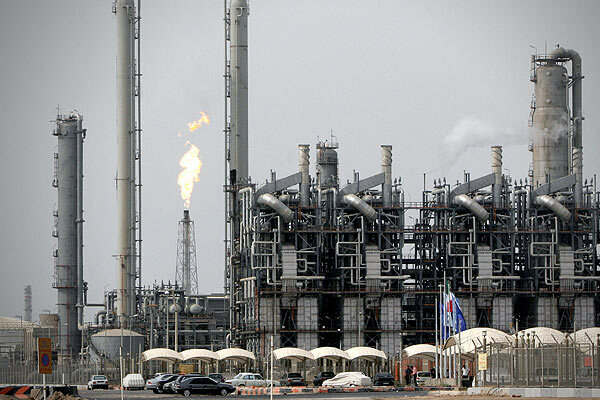 Based on the reports by the Coordinating Committee to Help Form Workers’ Organizations in Iran, on June 15, the police raid with machine guns on the meeting of the sixth general assembly of the organization resulted in the arrest of sixty of the labor activists. 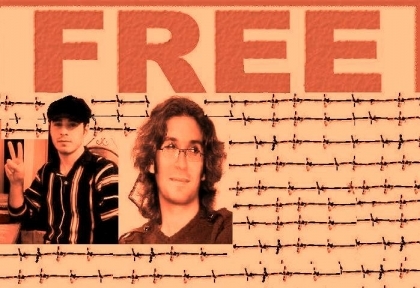 On June 16, Cyrus Fathi, Alireza Asgari, Jalil Mohammadi, Saeed Marzban, Massoud Salimpour, Maziar Mehrpour, Reihaneh Ansari, Faramarz Fetratnejad, and Mitra Homayouni remained arrested while the rest of the detainees have been freed. Reihaneh Ansari has received 20 days incarceration and 66 thousands dollars bail. According to the committee, the arrests were done at a house in the city of Karaj without showing any warrants and using machine creating an atmosphere of terror and fear in the neighborhood. Yesterday, Friday 15th of June at 12 noon 60 members of the Coordinating Committee to Help Form Workers’ organizations and a number of labor activists were arrested by agents of the city of Karaj. According to the latest news, Mitra Homayooni, Vafa Ghaderi, Reyhaneh Ansari, Khaled Hosseini, Mahmoud Salehi, Saeed Moghaddam, Cyrus Fathi, Ghaleb Hosseini, Mohammad Abdipour, Jalal Hosseini, Alireza Asgari, Masoud Salimpour, Abbas Andriyany, Sediq Amjadi, Fattah Soleimani, Maziar Mehrpour, Mhommad Molanai, Vahed Seyyedeh, Jalil Sharifian, Sediq Khosravi, Yusuf Ab Kharabad, Faramarz Fetrat Nejad Are among the detainees. (If new names appear they will be added to the list). reza shahabi must be free! Reza Shahabi, an Iranian labour activist, has been in held in Block 209 of Tehran’s notorious Evin jail, for months without conviction or even proper charge. Paying attention to the reality of his case shows that the situation for workers and working-class movements in Iran is different to that in Europe only in degree; bureaucratic and bourgeois-legalist excuses manufactured ad hoc to justify his continuing political incarceration, his alleged second trial remaining always just around a corner, since he was found to have no case to answer to on 25th May. The authorities have attacked him still further. He has been subjected to aggression and intimidation, pressured to cut even his scheduled fortnightly telephone conversation with his family. In response, Reza began a hunger strike, demanding his immediate and unconditional release. Beginning on 1st November, his hunger strike led to the formation of a committee for his defence which attracted hundreds of signatories from across the Iranian labour movement. Mahmoud Salehi, himself recently released from jail, has become the spokesperson for the group. The authorities increased their attacks on Reza, at one point using his weaknesses as an excuse to stop him from talking to his family, telling them that he would not see them. 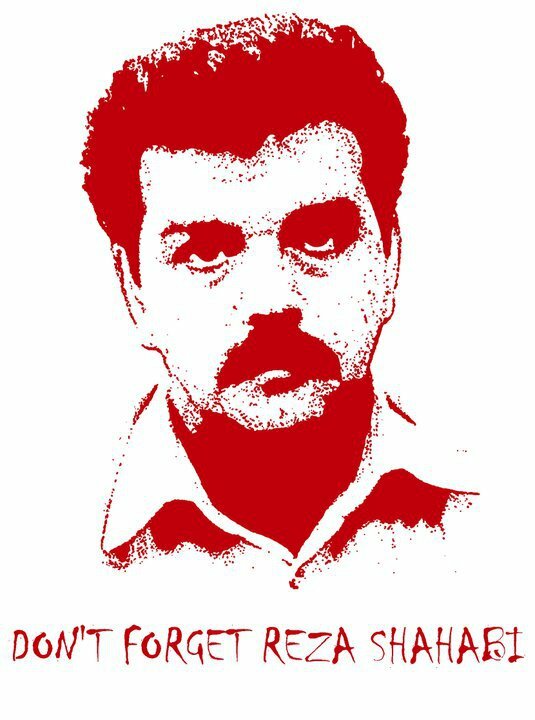 A communique from the Reza Shahabi Defence Committee, upon the twenty-first day of the jailed Iranian trade unionist’s hunger strike. For updates, see http://www.workers-iran.org. On Monday 21st Azar (14th December) the members of Reza’s family went to Evin prison to visit him. They were informed that, owing to his physical condition, it was impossible for him to be moved to the visiting room and that they were to move to Evin’s prosecutor’s quarters because he could be moved there by car. ‘One hundred unions. Thirty countries. One class.’ – Derrick Blackadder, of the Canadian Union of Public Employees, advanced this as the slogan for trade unionists to take home. It was an accurate summation of the discussions and workshops of the last two days. It was an exciting conference to be part of. The Internationale was sung in more languages than I had ever heard spoken before, by avowedly class-conscious trade unionists, who were calling for international solidarity against capitalist exploitation. 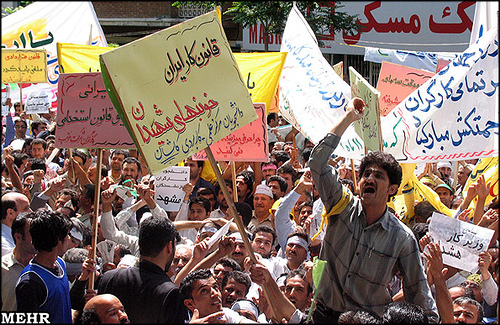 Communique from striking workers in southern Iran, translated for the International Association in Support of Iranian Workers.